There’s nothing really wrong with a Woody Allen movie set in the Eternal city, but there’s nothing really right about it either. I had a few problems with his latest film “To Rome with Love”, but I had a good time watching it and sometimes, that’s what really matters. As usual, he has assembled an impressive cast and given them colorful roles to play. 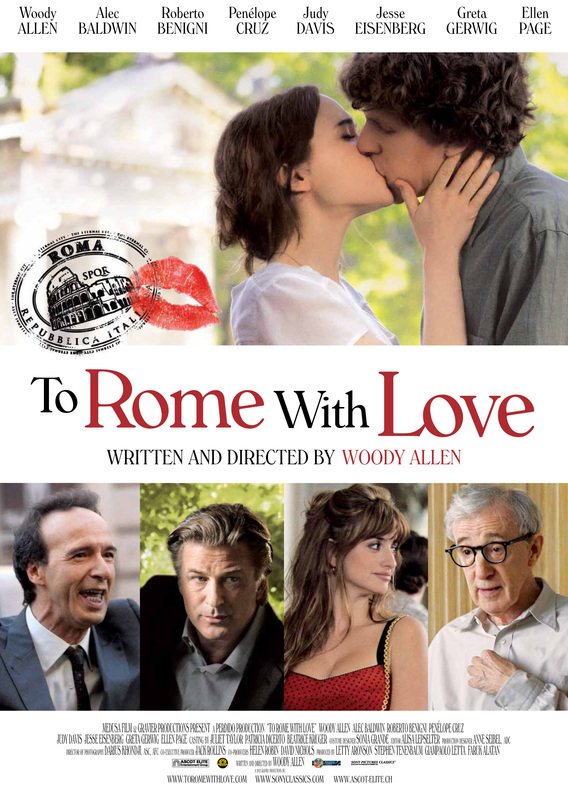 It’s a treat to watch Woody himself, Alec Baldwin, Jesse Eisenberg, Ellen Page, Roberto Benigni, Penelope Cruz, Judy Davis and a fine supporting cast in this uneven but amusing social roundelay set in Rome. The whole isn’t quite as good as the sum of its parts, but the movie is never boring. Another plus is the city itself, which makes you want to book a seat on the next plane. The movie opens with Alison Pil, an American tourist who falls in love with with a handsome Italian, forcing her parents (Allen and Davis) to visit. Then we meet Baldwin, who plays an architect trying to look up the street where he lived years ago and is recognized by Eisenberg, who invites him into his home. Greta Gerwig plays Eisenberg’s girlfriend who welcomes her neurotic friend (Page) to stay with them. Allen’s famous fatalism looms over the intertwined stories of ambition, self-delusion, unrequited love (or lust), and bad timing. It doesn’t always work this time around, especially the story involving Benigni who finds fame all of a sudden, but it’s a pleasure to see all these actors dig into the material. Of course I can’t place this film on the same level as “Match Point” or “Midnight in Paris”, but I also can’t dismiss it completely. All I can say is that it kept me entertained even though I knew that it had nowhere else to go. If you admire the actors as much as I do, and appreciate Woody Allen’s mindset, I think you will feel the same way. I agree that it is somewhat entertaining but the movie lacked quite a bit. When the closing credits rolled I had many questions. What was the point of that scene? Or that storyline? Etc. The film was full of pretty scenes (they were in Rome after all! ), great actors and a great director… But the script was weak. It almost felt like it was an unfinished film rushed out of editing to meet a deadline.